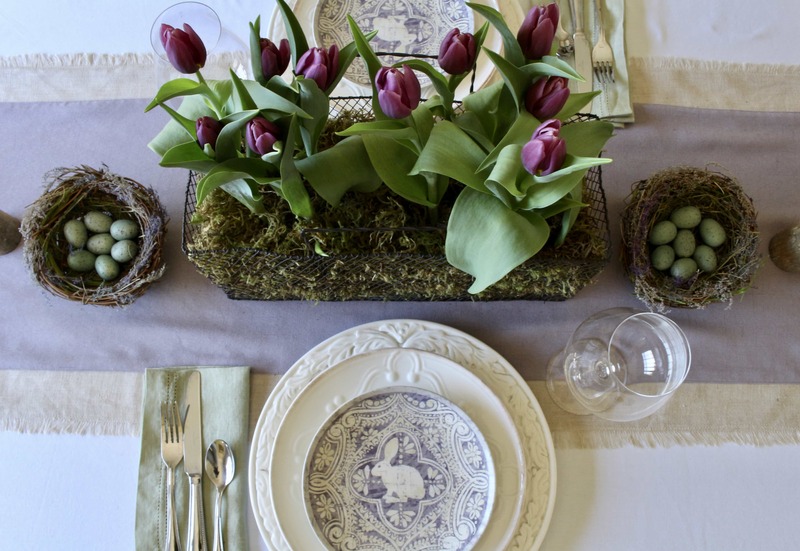 Easter is one of my favorite holidays, and definitely one of my favorite’s to do a tablescape for. The soft pale colors, the nests and eggs, and all the flowers make for such a fun season! 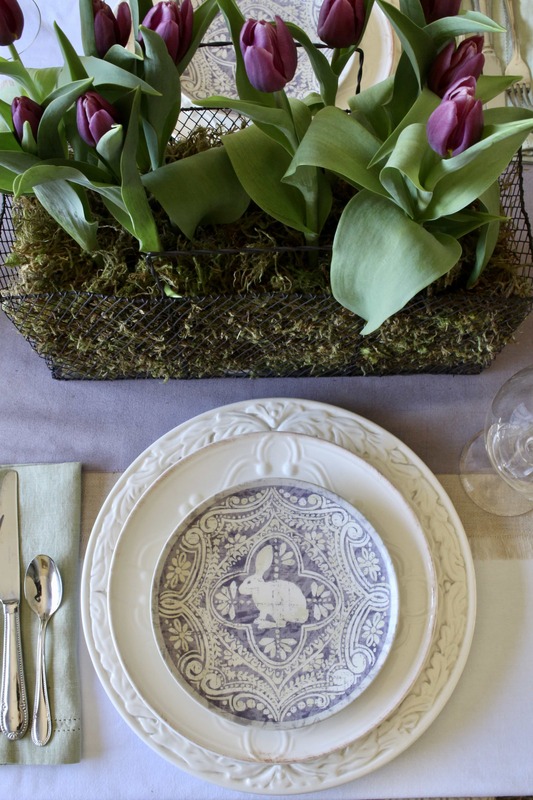 Today I’m sharing an Easter table that is both elegant and easy! As I usually do, I started with my themed plates and I let those set the stage for the rest of my Easter table. This time, I’m using salad/dessert plates from Pottery Barn and boy are they cute! These are from a couple of years ago, and at the time, they were selling out like crazy! I think I went to about 4 different stores just to get what I needed! I have the plates in 4 different shades, but for this table, I decided to just use the purple. Unfortunately, they are no longer available from PB, but you can still find them on Ebay. They were that popular! Last week I found some purple hyacinth in my local Ralph’s and once I got it into my head to use those, I was off and running. Of course, life sometimes has different things planned, haha! When I went back to get the hyacinth, they were all sold out. No worries, I just used some pretty purple tulips instead! 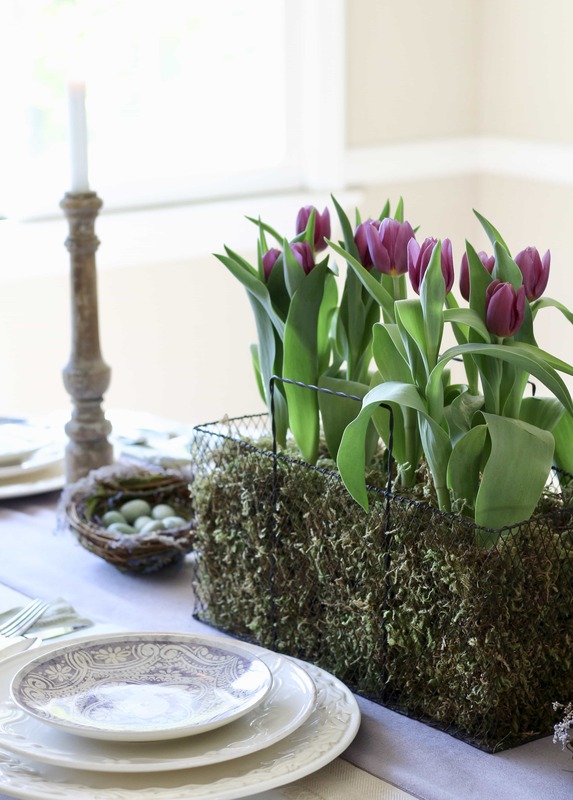 For the centerpiece, I simply added the tulips to a Pottery Barn metal basket that I already owned, and filled it in with some moss. 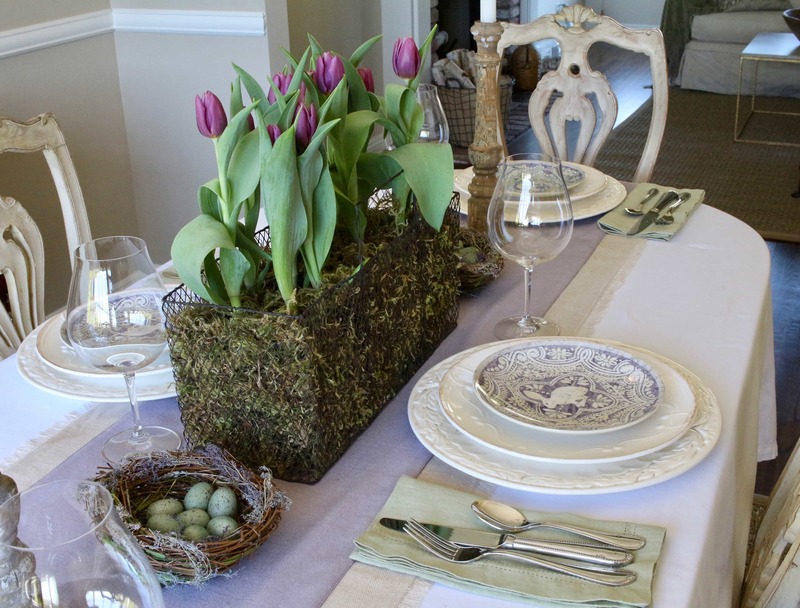 I adore purple and green together, so that seemed like the perfect palette for my Easter table. 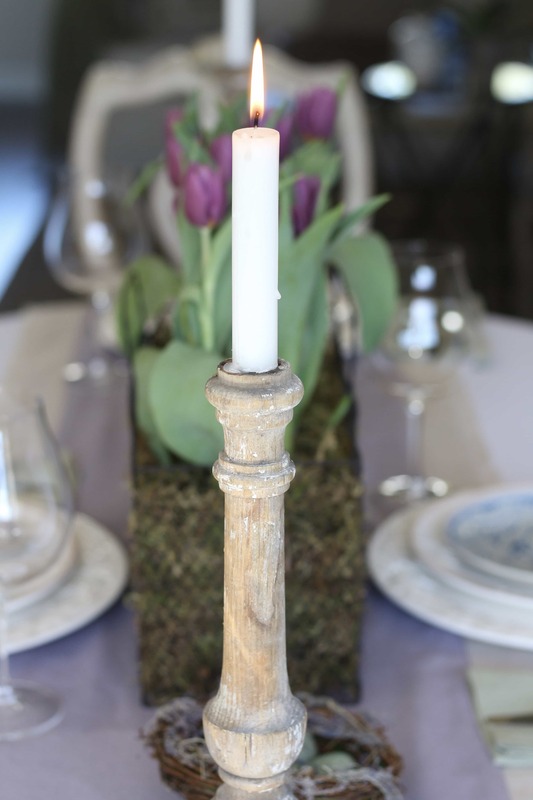 After using a basic white tablecloth as the backdrop, I added my flax colored linen runner from Williams Sonoma, and layered that with another lavender runner I found at Home Goods. Pale sage green napkins rounded out the tablescape. I also added a couple of nests that happened to be mostly green with some purple accents. 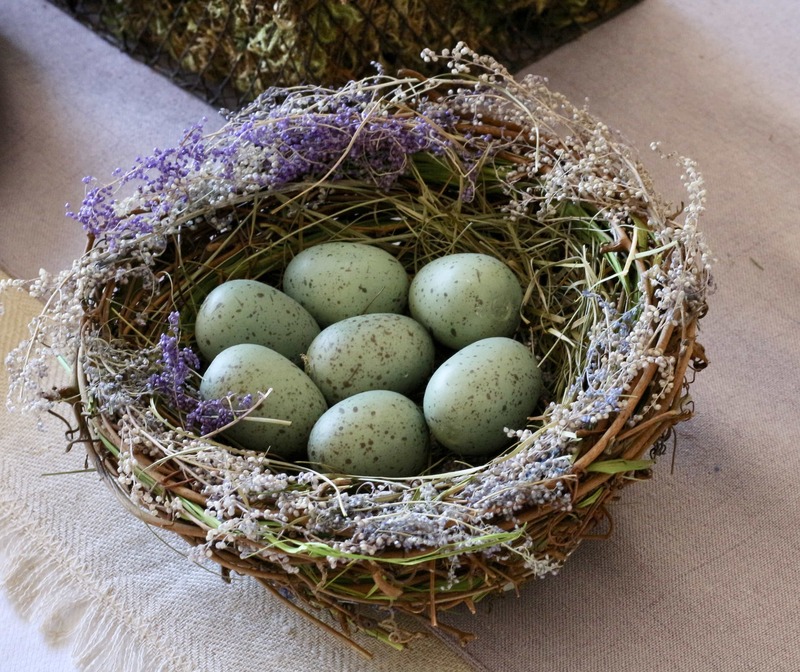 I think I mentioned before that I love eggs and nests for spring, so I have quite a few! The candlesticks are vintage and are part of an old railing of some sort. I had my husband hollow out the tops so that I could use them as candleholders! I love their chippy finish and how they add character to a table where everything else is new. 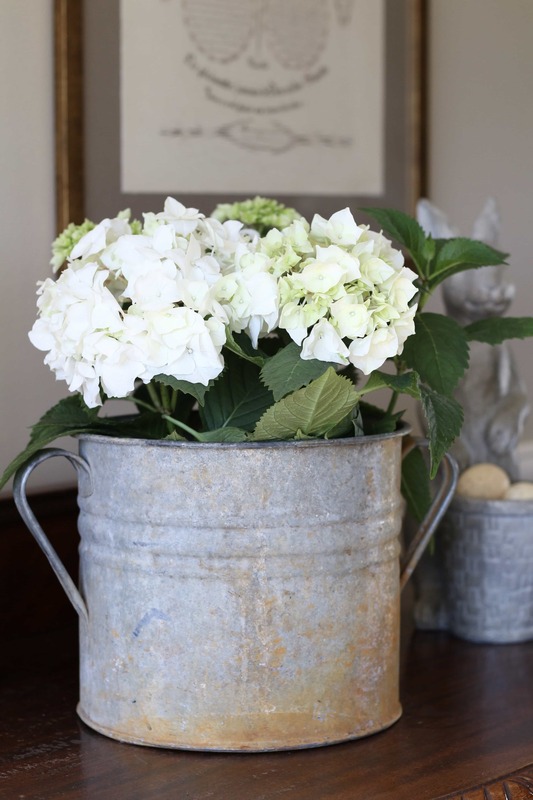 You might have seen this new-to-me vintage French zinc bucket on my spring kitchen post where I had it filled with tulips. Since I already had tulips on the table, I used white hydrangeas. Luckily, it looks good with anything I put in it! 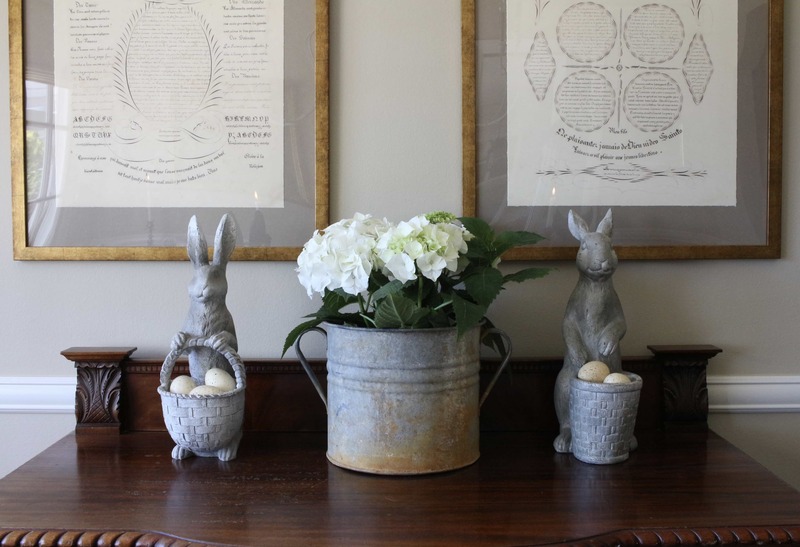 The bunnies are from Home Goods and I’ve filled them with faux eggs from Pottery Barn (similar here). I’m loving the purples and greens together. It created exactly what I had in mind! 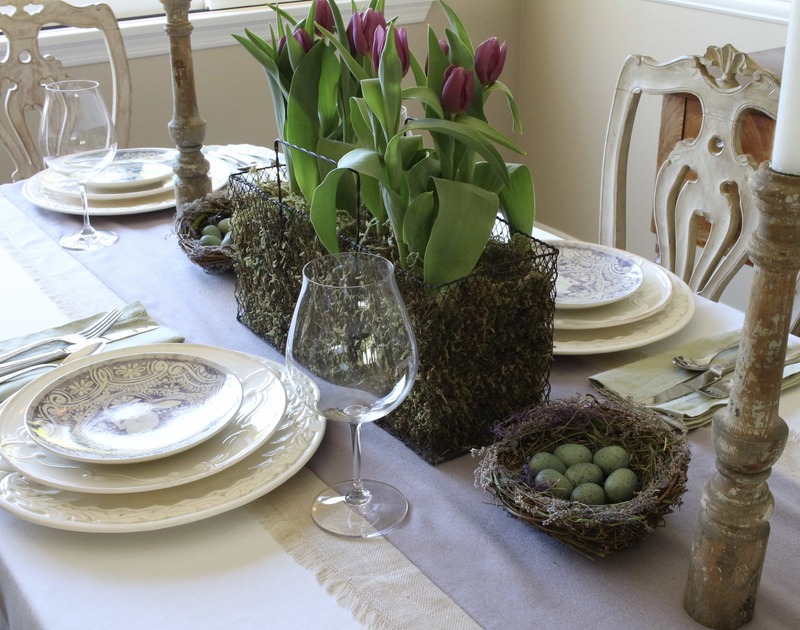 And Easter table that was easy to put together, and both casual and chic. 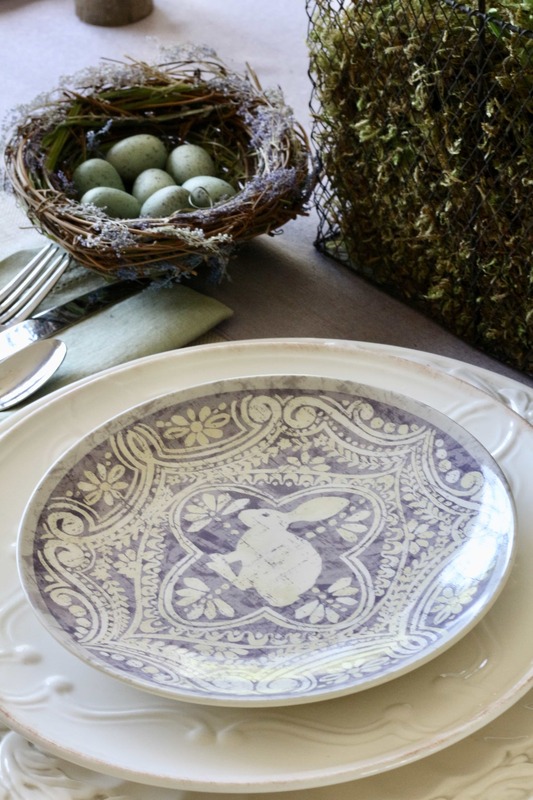 If you want to see my Easter tables from last year, you can see them here and here. Thanks again for stopping by! I know there are a lot of Easter/spring tours this time of year, and I so appreciate that you chose to visit here! I hope you’ll go on to the other bloggers being featured today. You can also sign up for my emails and get my free e-book, A Calendar of Tablescapes, featuring twelve of my favorites along with all my tips and tricks! Hi Shelia, I love purple and green together too. I have a passion for lavender and enjoy it paired with green. I wish NJ had better conditions make a full garden filled with lavender. Love your dishes, pretty. Thanks so much for visiting Cindy, and for your lovely comment on the tablescape! I don’t think I realized lavender wouldn’t grow in the east – I always thought it was so hardy and must grow anywhere! I do have it in my yard and the smell is amazing! 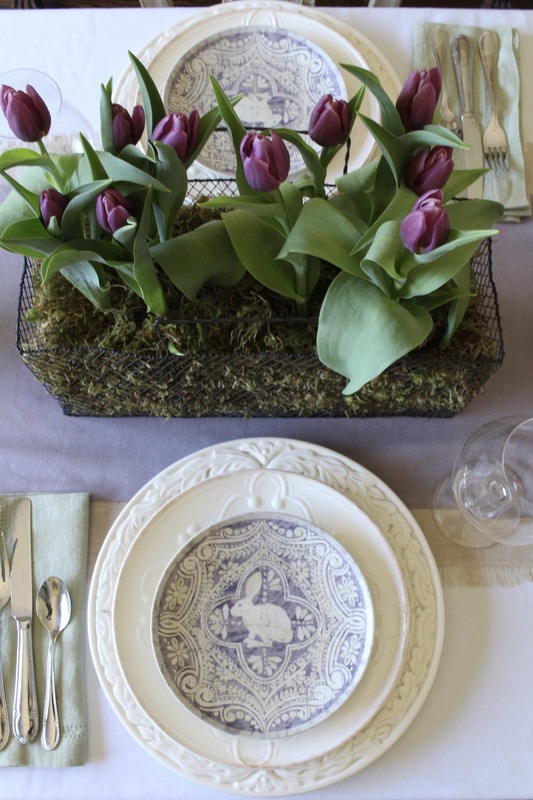 The place setting with the wonderful PB bunny plates, the tulips…..perfection! Beautiful, beautiful table! Happy Spring Sheila!….and thanks for all of the Napa Valley recommendations! Happy Spring and have a great weekend! And I hope you enjoyed Napa! happy spring to you too! Those plates are to die for! I’ll be stalking Ebay to try to get some. I love your colour choices. Most people go with pastels: pink, blue, yellow, green. The purple and green, are so different, and so elegant. Just gorgeous! Aww thank you so much! I must admit I love green and purple together, so I’m glad you loved it too! And yes!! Stalk Ebay – they definitely come up! Thanks so much for stopping and taking the time to comment! I so appreciate it. Just gorgeous ! 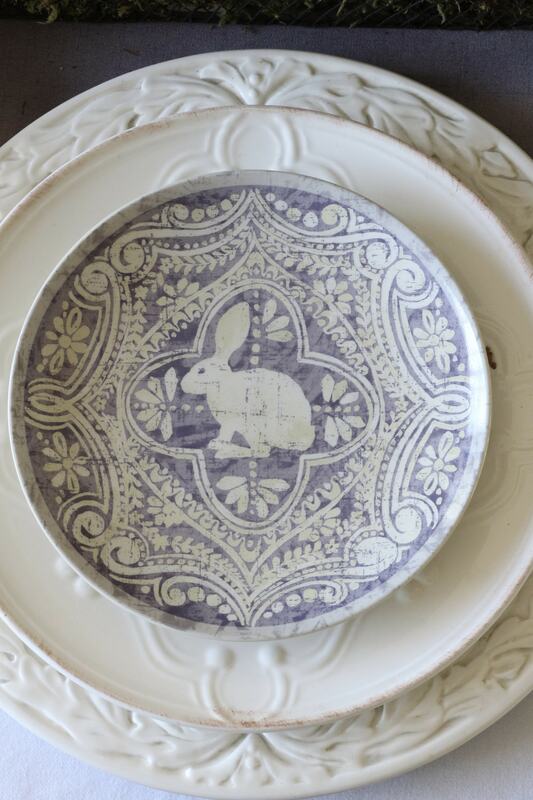 I love those bunny plates! Such a pretty table setting. Hope you’re doing well, and happy Easter to you! Oh, I remember seeing those Easter plates from Pottery Barn. I didn’t get them but I’ve always admired them. I love the way you decorated your table. The purple is absolutely gorgeous! Thank you so much Jen! They are awfully cute – you don’t have to do much when you start with such a cute plate! If you are interested, they can still be found on Ebay. I think I included a link in the post! So glad that you stopped by, and thank you so much for taking the time to leave such a sweet comment! I love the soft lavenders for spring! That’s a color you don’t find in the winter, so it always heralds spring. That’s so true Sandra! Pale purples represent spring to me as well! Thanks so much for stopping by, and for your lovely words! So appreciated! 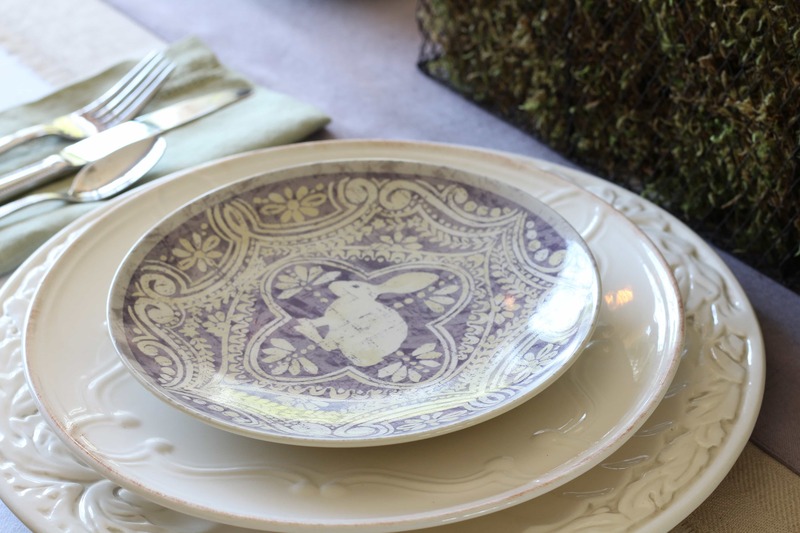 Those bunny plates are adorable and I love the white plates you layered them with as well. What a beautiful table with great textures! Sheila, I love your table! I have those Pottery Barn plates – I bought them in an array of colors, aren’t they just the cutest? 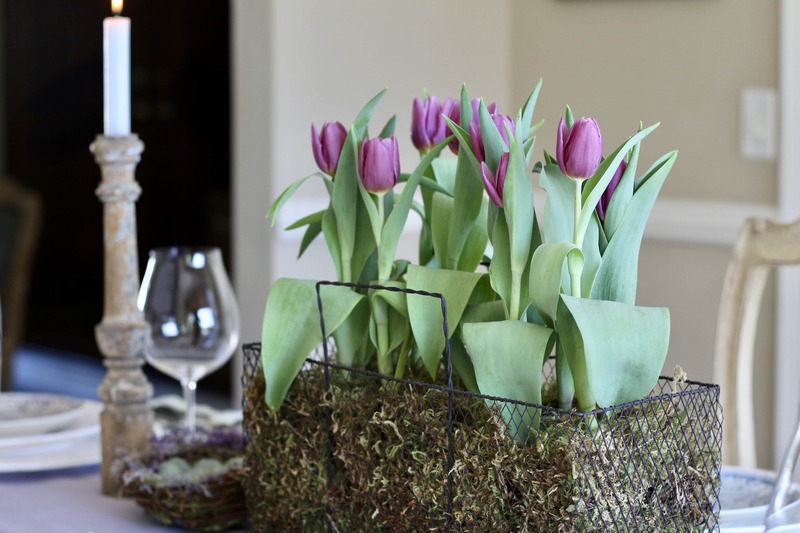 I love the basket you filled with moss and tulips. Lovely table, hope you have a nice weekend! Yes, I absolutely adore these plates! I wanted them so badly when they came out, I was running all over town to get 4 of each color:)) Can’t wait to see you use yours as well! Thanks so much Angelina, and happy weekend! Aww thanks so much Emily! 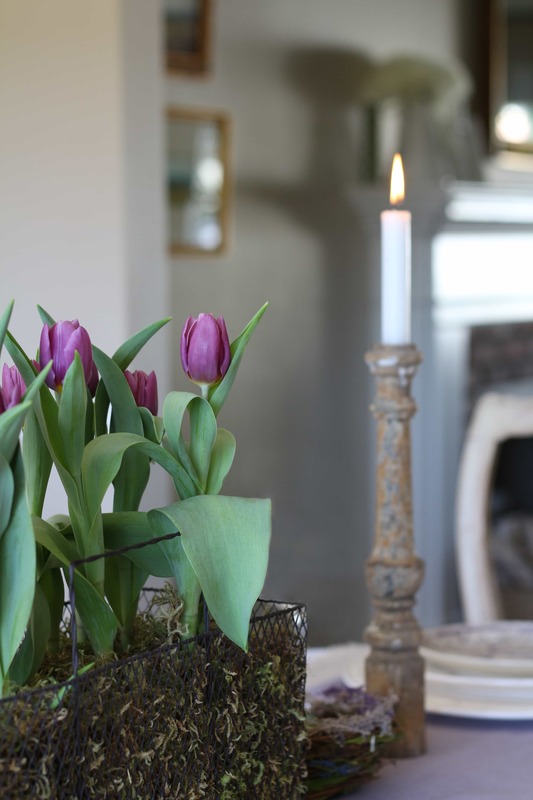 I was so loving purple this season, I don’t know why, I was just inspired:) But tulips are great in any color! did you put soil in your pot with the tulips. Love the arrrangement. Thanks so much! And yes, I did. These are plants, not stems, and there is a pot with dirt which I then covered up with moss on top of that. Sheila, what an absolutely gorgeous table! I love those plates and that’s the same way I start out a table. (Always fascinates mw when people start with the centerpiece or something else.) 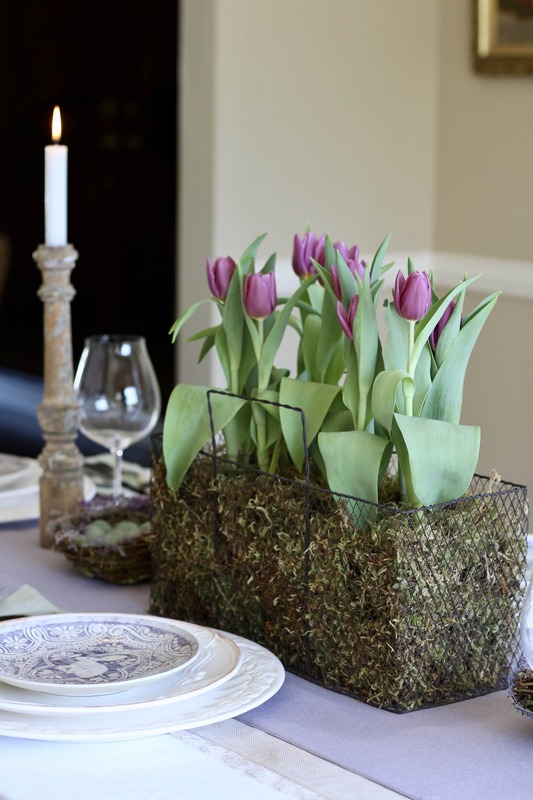 The palette is so pretty and how funny that you planned it with hyacinths, because the tulips look perfect! 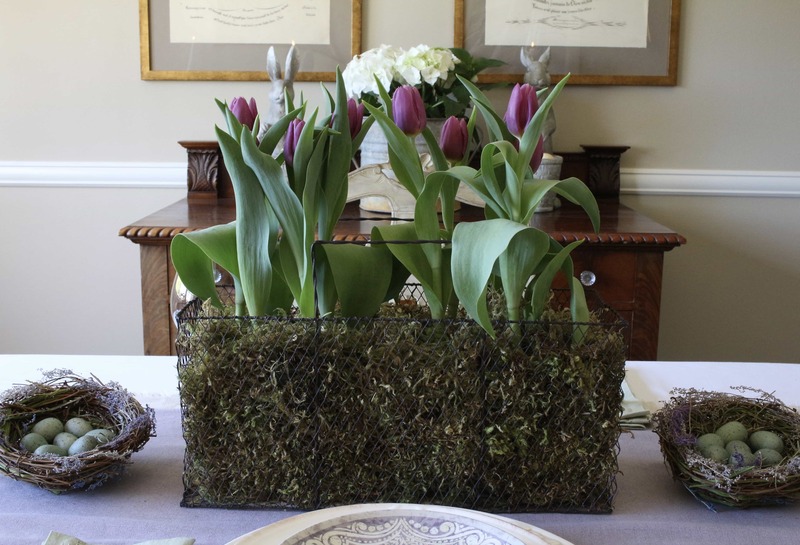 I love your centerpiece and the way the moss serves up the tulips. Just beautiful!! Thank you so much Lory! And yes, I always plan my table around my plates:) Glad to hear your do that too! I would’ve loved to have done this with the hyacinths, but nature didn’t let that happen I guess! I swear they were only in the store a few days so by the time I went to buy them for this table, they were long gone. I’m so glad you like it with the tulips! Thanks again for having me. I am so happy to be “touring” with this amazing group! So very Lovely Sheila! The purple tulips and plates are perfect together. Happy to be touring with you again! Glad to be “touring” with you again! Happy Easter!